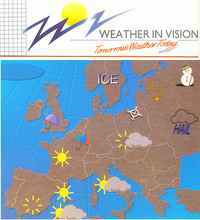 Weather graphics system developed at Spaceward Graphics in 1988-9. In use by ITV for all national weather forecasts from 1989 to 1994. The project was developed in collaboration with the Meteorological Office in the UK. It downloaded and animated radar and satellite imagery and allowed the simple placement of symbols on maps. This entry was posted in past glories and tagged product, projects. Bookmark the permalink.